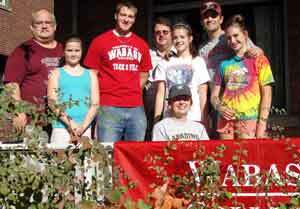 The weather was perfect for our volunteers to help community causes in NW Indiana this year. In the a.m we gathered together to build a paver path for the Tri-Town Safety Village in Schererville. The village educates grade school children on railroad, home, crosswalk, fire and other safety issues. Our path was built to a life size caboose that the kids tour through. Participating were Kim Udchitz (Wabash friend), Derek De St Jean (Wabash hopeful), Doug and Lorraine Shelbourne (Wabash alum and spouse), Bridgette Banser (Wabash friend) and Chuck, Fiona and Jenna McCarroll (alum, spouse, daughter). We worked so fast they ran out of pavers! In the afternoon we traveled to the Old Sheriff's home in Crown Point (recent site for filming of Public Enemies) where we stripped and painted prison bars that hadn't been touched in 85 years. The old home is currently going under full renovation as a historic landmark and relies heavily on volunteers. They were so pleased with our efforts they want us back next year. Thanks to all. Participating were Jim and Rachel Wadkins (alum and daughter), Bridgette Banser (Wabash friend), Derek De St Jean (Wabash hopeful), Doug and Lorraine Shelbourne (alum and spouse), Chuck, Fiona, Lauren and Jenna McCarroll (me and my whole crew).